Learning all of the things that go with using the potty can take a few weeks. It’s also normal for big milestones like staying dry through naptime and overnight to take months to master. If you are stressed about potty training, your child will be stressed too. Build in enough time for potty training so you don’t feel rushed. Accidents will happen and are part of the learning process. Don’t bring much attention to them, instead focus on the positive. Praise your little one for their successes, and handle accidents calmly. 4. Let your child lead. Children are more receptive when they aren’t pushed or nagged. Remind them gently and let them do as much on their own as they can. For example, if you are using a potty timer, let the child set it and turn it off when it goes off. Once you’ve committed to potty training, stick with it! Diapers and training pants are okay for naptime and bedtime. Just don’t use them when your child is awake (very tempting when you are on-the-go) as it could undo the progress you’ve made. 6. Pick the right time. Don’t start potty training if you are in planning a major change like a new sibling or moving to a new home. Wait until you are able to be focused on potty training. It is best to start when you can dedicate 2 full days to being home (often a weekend). There is no correct way to potty train your child so do what works best for your family. This is most important tip. I’ve personally tested the fun and non-fun way of potty training and hands-down the fun version is much more effective and, well, more fun 🙂 Kick off potty training with a simple “potty party” and give little rewards when your child uses the potty. 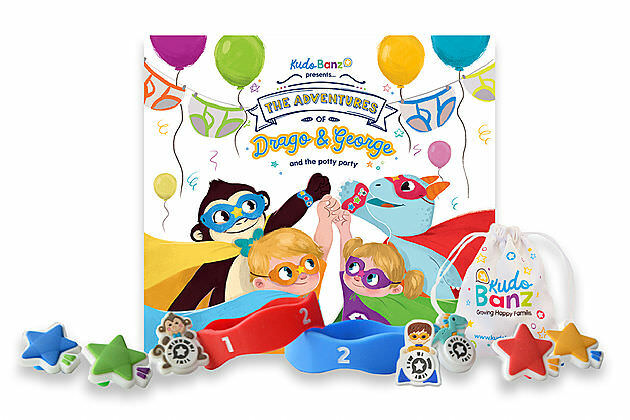 Check out our Kudo Banz Potty Training Kit, which comes with everything you need to make potty training fun and effective.